You’ve heard of the late Red Smith, legendary sportswriter for The New York Times and the New York Herald Tribune and a member of the National Sportswriters and Sportscasters Hall of Fame? Well, this is not about that Red Smith; it’s about Atlanta’s Red Smith, a man who has so many trophies (350) in the recreation room of his northside Atlanta home that you can hardly get through the door. This Red Smith, Atlanta born and bred, is not only a legend, he is a phenom who accomplished his impossible dream — making track and cross country champions out of kids from ages 5 to 18. Red’s Northside Red Runners are known nationwide. His track teams have won 50 national championships and his cross country teams 10. Since he started his program 33 years ago with eight preteen girls, he has produced 600 county champions and 300 state champions. Sixty of his runners have won college scholarships. Two years ago, at the National Sportswriters and Sportscasters awards dinner, the Sporting Goods Manufacturers Association presented Smith with its National Hero award and a check for $10,000 for his track and cross country teams. Last year the Atlanta Track Club presented him with its Coach of The Year award. He could have been named Coach of The Century. Seventy-six years old with a full head of red hair, Smith is not only an innovator as a coach; he is a bona fide legend as a competitive athlete. At Atlanta Boys’ High School, he not only captained the track and cross country teams, he coached them. He won the state cross country championship two consecutive years. He was named to the cross country and track and field all-state teams. Smith won an athletic scholarship to Georgia Tech where he was twice captain of the cross country team and once co-captain of the track team. He won the Southeastern Conference cross country title his junior year when he set a Tech school record of 18 minutes and 42 seconds for four miles on the old Howell Mill course. The record stands after 58 years. Robert William “Red” Smith grew up in what is now called Poncey-Highland and attended Highland Elementary School and Bass Junior High School. He spent his afternoons at the old Piedmont Park Polo Grounds on his bicycle, racing a stable of horses around the Polo Grounds track. In the summers, he attended the old Bert Adams Boy Scout camp in Vinings. Both Red and his twin sons, Robert and Ralph, 46, were Eagle Scouts. Red has two daughters, Edith, 49 and Bonnie, 41. They were among the first members of Red’s Runners. When he started his Northside Red Runners in 1971, he was in a league of his own. Today there are 70 pre-teen and teen amateur teams around Atlanta. Thank you, Red Smith. Red’s Runners practice 150 days a year and participate in 19 track meets and eight cross country meets. 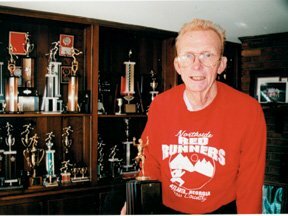 Red has coached more than 3,000 runners. Among them are the King sisters, Andrea and Tenisha. Andrea was a five-time NCAA All-American and a five-time Atlantic Coast Conference women’s indoor and outdoor MVP at Georgia Tech. She won the 100-meter hurdles at the 1999 World University Games. Tenisha won a track scholarship to Notre Dame where she won a 100-meters hurdles championship at the Missouri Invitational. Red has made his program a family affair. Parents attend most every practice, rake sand, act as judges and timekeepers, set up hurdles and assist as coaches. Aside from his own teams, Red has coached at Holy Innocents School the past 10 years. He has conducted a life insurance practice for Pacific Life the past 50 years. It’s a full plate for a man who has Parkinson’s disease and spends part of his day in a wheelchair, while also helping care for his wife, Barbara, who has MS.